Yuengling's was the first to announce new stuff. March will be the debut for Butter Pecan, Cherry Vanilla Chunk, Cookies & Cream, and.... Cinnamon Churro (review here). Sorry, I had to save churro for last. It's got a great idea in baked churro pieces and cinnamon swirled in vanilla ice cream which I'm hoping means it will taste like a cinnamon base. Turkey Hill emailed out their new stuff today though their website isn't updated just, but they are keeping the idea of Red Velvet Cake alive (review here) with an April-June flavor and then giving us one of my favorite summer treats, a S'mores flavor for July-September (as well as an Espresso flavor). It's kind of funny how Mango seems to have picked up a bit of steam last year and now in to 2016. We're still waiting (announced 2/3/16) for the nationwide distribution of the new (vegan) non-dairy Ben & Jerry's "ice cream" made with almond milk. Actually, I forgot about the Blue Bunny almond milk frozen dessert as well. They'll come in vanilla, chocolate, mocha fudge, and mint chocolate chip. >>> WAIT! It's now Oct 2016. I never saw these hit shelves and they are off the blue bunny website. That is... surprising (for the most part anyway). 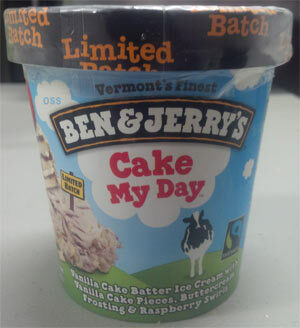 Update #1: Ben & Jerry's "Cake My Day" is the fun, new, limited batch flavor containing vanilla cake batter ice cream with vanilla cake pieces, buttercream frosting and raspberry swirls. "Peanut Butter & Cookies" is the new, great looking Walmart Exclusive flavor with sweet cream ice cream with chocolate sandwich cookies and a crunchy peanut butter swirl >>> PB&Cookies has been replaced with the excellent Pecan Sticky Buns ice cream. In May, Empower Mint came out. I've seen a few cores disappear from stores and now we know why. 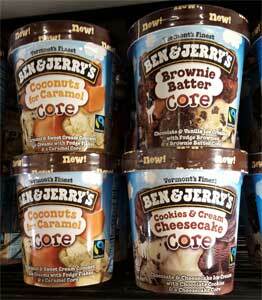 Ben & Jerry's introduces Brownie Batter Core, Cookies & Cream Cheesecake Core, and Coconuts for Caramel Core! Update #2: Turkey Hill just updated their website with four new all natural flavors (reviews here) and 5 new "gelato swirls". I didn't get my wished for all natural cookies & cream (yet! ), but I like the expansion and dedication. My first experience with it was kind of meh. Second experience also not so hot. Update #3: The fine folks of Perry's Ice Cream have already sent over samples of their three new 2016 flavors: One Buffalo, Bourbon Caramel Pecan, and Chocolate Hazelnut. See, they've ditched the "escapes" branding for their pints and quarts and now all products will feature their classic black styling. Flavors making the branding transition include Toffee Coffee, Grasshopper Pie, and Sponge Candy. I'll admit, I'm a little surprised to see Dove put out something new. 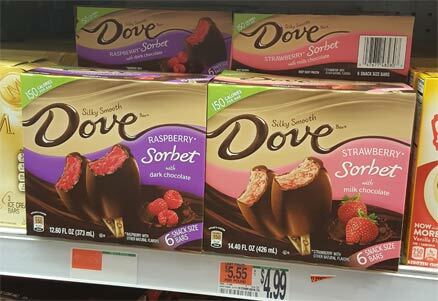 It's pretty slick of them to mix their calorie rich shell with a low/no fat sorbet middle. I would have picked them up, but I wasn't in the mood to dump five bucks on a potentially cross contaminated product. 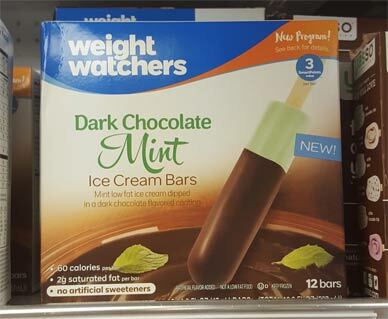 We haven't reviewed a weight watchers product since July 2014 and to be honest, I don't know if that will change anytime soon. The only reason I really tried them before was because Wells would send over free samples of them. Even on sale for four bucks, I wasn't tempted to try this box of 12 when deep down I only need one (or two) to sample. Update #4: The Impulsive Buy readers have spied a Nestle Butterfinger Peanut Butter Cup frozen bar (review here) to compete with the Reese's version as well as chocolate covered Skinny Cow ice cream sandwiches. SC has three varieties in the form of Vanilla Bean Dream, Ultimate Chocolate, and Creamy Caramel. I reviewed the Ultimate Chocolate here but haven't tried the others as I'm not sure if the included sorbitol messed with me a bit. Update #6: Not one but two new double shelled Magnum bars this year. 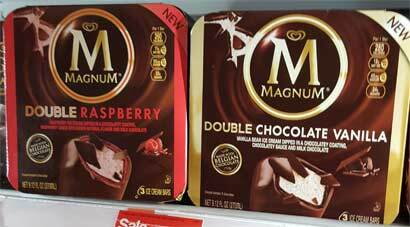 I've now spied both the Double Raspberry and Double Chocolate Vanilla at multiple locations. 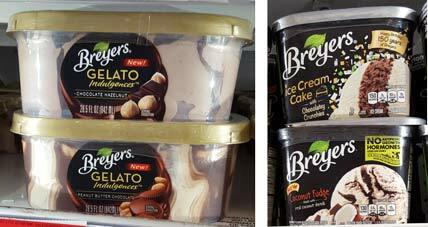 Update #7: I spied a few Breyers Gelato flavors getting discontinued at Stop & Shop which is often a sign of making room for new flavors. Well, so far I have spied chocolate hazelnut gelato (Nick was unamused by it), peanut butter chocolate gelato and salted caramel truffle gelato. There will also be a chocolate fudge truffle flavor. I've also come across new flavors in the form of Ice Cream Cake Ice Cream (review here), Coconut Fudge Frozen Dairy Dessert, and Chocolate Peanut Butter ice cream. That's right, two of those three are labeled "ice cream"! Even though I don't have Yuengling's in my area, happy to see someone using a vanilla base for a churro ice cream; Blue Bunny's chocolate base in the "Hot Chocolate Con Churros" just didn't click for me, even though the base was "cinnamon spiced" and had churro pieces as a mix-in. Every year, Ben and Jerry's send several flavors to the graveyard. Any news on which flavors are kicking the bucket this time? @Billy: Not sure, everything not making the non-GMO transition should be gone at this point. This may sound mean, but I would love to see their greek froyo just disappear, at least from the freezer aisle. Let's have them focus so more attention on the core lineup maybe. I'd cut the Core flavors, Boston Cream Pie, Red Velvet Cake, and Triple Caramel Chunk, personally. @Billy: I know they have to cut something, but it'ls weird to think of them cutting something they just spent a bunch of time making non-GMO. Wait and see I guess. Looks like the SNL scoop shop flavors are gone from the website. Also, although it is still pictured in the list of flavors, Coffee Toffee Bar Crunch is showing up in the list when you go to 'Resurrect a Flavor'. Hey have you heard what the next Edys limited edition flavore will be? Each year I wonder if we will see bacon flavored ice cream. I can see a maple ice cream base with bacon pieces mixed in since maple and bacon pair well together. It's not unusual in some ice cream shops around the U.S. I saw an edys limited edition in target but I think I have seen it other years although that might have been a turkey hill flavor before...it is touchdown sundae...vanilla ice cream with fudge and chocolate covered caramel footballs. Or something like that...I didn't get a picture. @Deb: touchdown sundae showed up in 2011 for Edys. Technically multiple companies do use the mini footballs to make a touchdown sundae flavor. I would love for Ben and jerrys to bring back the fudge truffle core ice cream...vanilla with chocolate chunks, chocolate with white chocolate chunks and a fudge core. I think they also used to have a plain mint chocolate chunk (vs cookie prices in mint) that was excellent. For Breyers I miss the chocolate chocolate chip. I also saw easy rocky road which I think may have disappeared for awhile...one of the few with mini marshmallows vs the marshmallow swirl. Will someone *please* make a Maple Nut Goodies ice cream? Vanilla base with a maple ribbon and chopped up maple nut goodies running throughout - it would be amazing! Sitting with a tub of Hagen Daz mango icecream....its sooo yummy and luscious but gives a bit too sweet aftertaste. nevertheless really worth a try for mango lovers ! !